When you combine water and iron (including steel) you get rust. Rust is a result of reaction between water and iron in the presence of oxygen. The more rust there is the faster it will keep rusting. Given enough time, rust will destroy anything made of iron. Once rusting starts, it is difficult to stop. The best way to protect iron products is by coating them properly. Once rusting begins the only way to stop it is to completely clean the rust away. What exactly is rust? Rust is hydrated iron oxide. Oxygen, water and iron react to form this compound. It first appears as brownish coating over the surface of iron products. Rust will bubble paint or other coatings off the iron or steel. Rust also leaves ugly stains on any surfaces in contact with the iron. It will also destroy the iron making it weak and fragile. Can you see how bad rust could be on your DIY electric car? Any item made of iron is susceptible to rust. The best way to deal with rust is to prevent it from rusting in the first place. Once metal products start to rust, it will not stop until the entire part is destroyed. Therefore you need to watch carefully for telltale signs of the initial stages of rust. 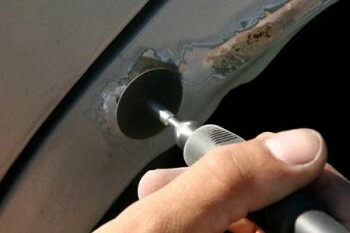 Once rusting starts, you must treat it immediately or it will spread like cancer to other metal parts of your vehicle. How can you prevent rusting on your EV project donor car? Firstly, you have to keep oxygen and moisture away from any iron products on your car. Since an automobile is made mainly or steel, doing so will be a tall task. Remember, iron rusts when it comes into contact with water and air. So, when you take either water or oxygen, there is no rust. Now, moisture and oxygen are everywhere; so how can we stop them from coming into contact with the metal? The most common solution is by coating the surface of the metal with a material that will not allow moisture, water and oxygen to penetrate in. As we all know that oil and water repel each other, therefore grease and oil can be a good insulating material for metals. If you apply oil, grease, primer, paint or any other oil-based coating all over the metal surfaces it will prevent rusting. However, the problem begins when the paint coating comes off either from wear and tear or from scratches. To prevent the occurrence of metal oxidization, even the smallest scratch should be resealed as soon as possible. How to choose an anti-rust solution for your homemade electric car? The way you select the right option is by determining where the coating is to be used. Since the donor car you used for your DIY electric car project is old, chances are there will be some levels of rusting. Begin your restoration work by cleaning the rust off any metal surface. To make your work easier, use a spray on rust remover. With a spray product, your work is reduced to just spraying and wiping. Using sandpaper and other products work but are very labor intensive. With organic rust removers, you can get rid of rust without any mechanical work. On severely rusted parts, you may have to repair the metal before re-coating it. No doubt it is a lot of work, but trust me, it is all worth it. After you’ve spent thought thousands of dollars and months on converting your conventional automobile into a pure electric car, you don’t want your EV to fall apart due to rusts on the metal components.